The Calumet River (/ˌkæljʊˈmɛt/) is a system of heavily industrialized rivers and canals in the region between the neighborhood of South Chicago in Chicago, Illinois, and the city of Gary, Indiana. Historically, the Little Calumet River and the Grand Calumet River were one, the former flowing west from Indiana into Illinois, then turning back east to its mouth at Lake Michigan at Marquette Park in Gary. The name "Calumet" is from the French colonial name for a particular type of Native American ceremonial pipe that served as a universal sign of peace among the Illiniwek, and which was presented to Pere Marquette in 1673. Before human alteration, water flowed westward from LaPorte County, Indiana, along the Little Calumet River, made a hairpin turn at Blue Island, and flowed east along the Grand Calumet into Lake Michigan at the Miller Beach community of Gary, Indiana. The area is extremely flat and the course and even the direction of the river system has changed repeatedly. The low gradient gives the river only a very small current. Industrial development in the Calumet River area began around the 1870s, and by 1890 the western reach of the Grand Calumet River was heavily polluted with the waste of steel mills, foundries, a meat packing plant, and glue and cornstarch factories. Industry continued to spread along the eastern reach of the river between 1890 and 1910, with similar results. These decades of unrestricted pollution have left the river sediments highly contaminated to this day. In September 2008, areas of Lake and Porter County, Indiana, were declared national disaster areas. The Little Calumet River breached its levee and flooded portions of the towns of Munster and Highland, Indiana. The Calumet River, on the south side of Chicago, originally simply drained Lake Calumet to Lake Michigan. A canal extending it, legendarily claimed to have been created by voyageurs at the site of a frequent portage, was dug connecting the two Calumet Rivers at the point where the name now changes from Grand to Little. The Grand Calumet River, originating in Miller Beach, flows 16.0 miles (25.7 km) through the cities of Gary, East Chicago and Hammond, as well as Calumet City and Burnham on the Illinois side. The majority of the river's flow drains into Lake Michigan via the Indiana Harbor and Ship Canal, sending about 1,500 cubic feet (42 m3) per second of water into the lake. Today, a large portion of the river's flow originates as municipal and industrial effluent, cooling and process water and storm water overflows. Although discharges have been reduced, a number of contaminants continue to impair the area. The Little Calumet River originally flowed in New Durham Township, LaPorte County, Indiana, to its junction with the Grand Calumet and Calumet rivers, but construction of the Burns Waterway in 1926 effectively cut the Little Calumet River into a west and an east arm. 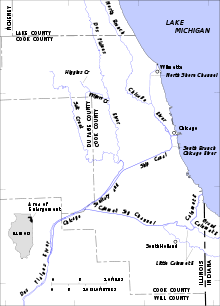 The west arm is now known as the Little Calumet River proper, and it flows through or borders the towns of Portage, Lake Station, Gary, Highland, Griffith, Munster, and Hammond, then through South Holland, Dolton, Lansing, Calumet City, Harvey, Riverdale, Phoenix, Dixmoor, Burnham, and Blue Island in Illinois, connecting at the junction of the Grand Calumet River and Calumet River. This arm of the river is 41 miles (66 km) long. Its flow has been divided by the Burns Waterway since 1926 with the portion east of Hart Ditch in Munster flowing east to the Burns Waterway and out to Lake Michigan, and the portion west of Hart Ditch in Munster flowing west to the Calumet River and Cal-Sag Channel. The Little Calumet has 109 miles (175 km) of river and tributaries and drains 213 square miles (550 km2). The major tributaries are Deep River and its Turkey Creek sub-tributary, and the Salt Creek tributary of the East Arm Little Calumet River. Each tributary originates on the Valparaiso Moraine and flows north to the Little Calumet River. The East Arm Little Calumet River, also known as the Little Calumet River East Branch begins just east of Holmesville in New Durham Township, LaPorte County, Indiana, and also flows through Chesterton, Porter, and Burns Harbor where it connects to the Port of Indiana-Burns Waterway. It has a total length of 22 miles (35 km). It used to continue westward to Illinois as the Little Calumet River, but construction of the Burns Waterway in 1926 diverted its flow into Lake Michigan. Until sometime in the late 1940s or early 1950s, the Little Calumet River was heavily polluted with sewage, and the only fish living in the river were carp. During heavy spring rains, the river would often flood areas adjacent to the river. The Little Calumet River has been undergoing construction of a $200 million flood control and recreation project by the Chicago District of the U.S. Army Corps of Engineers since 1990. The project was expected to be complete in 2013. The project includes construction of 22 miles (35 km) of levees and floodwalls, a control structure at Hart Ditch, and almost 17 miles (27 km) of hiking trails. Additionally, seven miles (11 km) of the river channel is being relocated to allow better water flow, and highway bridges are being modified to permit unobstructed flow of water. A flood warning system is also being implemented. When complete, the project will protect over 9,500 homes and businesses in the towns of Gary, Griffith, Hammond, and Munster in Indiana, and prevent nearly $11 million in flood damage annually. 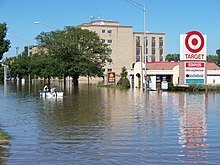 On September 15, 2008, the remnants of Hurricane Ike released heavy rain which flooded the banks of the Little Calumet River. Houses and strip malls in northern Munster and southern Hammond were evacuated. Hundreds of homes were damaged due to flooding. Recently, a new levee, along Northcote Avenue in Munster, is being built to protect residents from future floods. 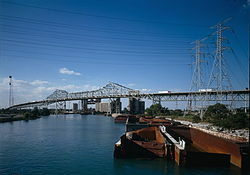 The Cal-Sag Channel (short for "Calumet-Saganashkee Channel") is a navigation canal in southern Cook County, Illinois. It serves as a channel between the Little Calumet River and the Chicago Sanitary and Ship Canal. It is 16 miles (26 km) long and was dug over an 11-year period, from 1911 until 1922. The Cal-Sag Channel serves barge traffic in what was an active zone of heavy industry in the far southern neighborhoods of the city of Chicago and adjacent suburbs. As of 2006 it was also used more as a conduit for wastewater from southern Cook County, including the Chicago-area Deep Tunnel Project, into the Illinois Waterway. It is also used by pleasure crafts in the summer time. The western 4.5 miles (7.3 km) of the channel flow through the Palos Hills Forest Preserves, a large area of parkland operated by the Forest Preserve District of Cook County. The Cal-Sag Channel served as the rowing venue for the 1959 Pan American Games. The Calumet-Sag Trail, a 26-miles-long (41 km) greenway, will border the channel and will stretch from the Chicago Sanitary and Ship Canal to the Burnham Greenway when it is completed. ^ a b c Little Calumet River Watershed Management Plan (PDF) (Report). Indiana Department of Environmental Management. 2008. Retrieved September 3, 2017. ^ a b State of Indiana Coastal Nonpoint Pollution Control Program Environmental Assessment (PDF) (Report). National Oceanic and Atmospheric Administration. September 2007. p. 13. Retrieved 2011-05-02. Wikimedia Commons has media related to Calumet River. This page was last edited on 29 December 2018, at 15:33 (UTC).